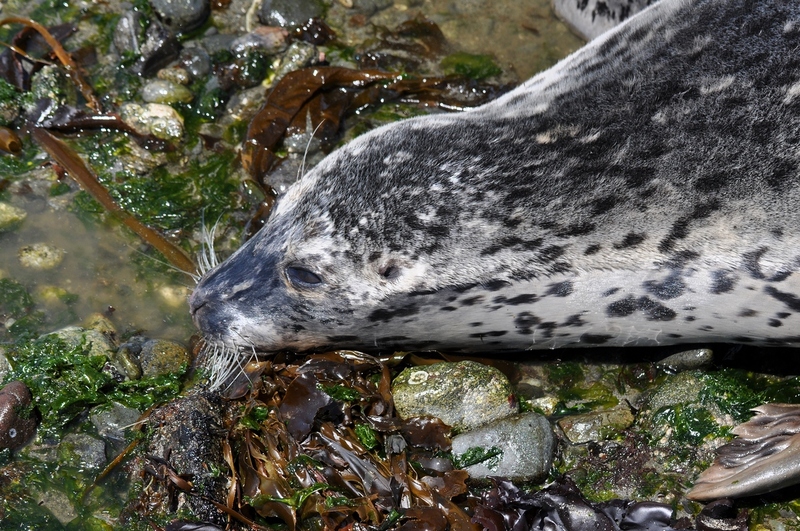 The Harbor Seal pups are born in Puget Sound mainly during the Summer months. The first new pups have shown up as of the second week in June. Seal Sitters responded to a report of a seal on the beach just north of Constellation Marine Reserve in West Seattle. A female adult seal was observed alive but died within about an hour of first observation. She had given birth about two days earlier. 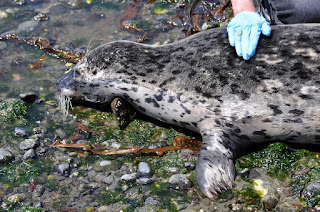 A necropsy determined that she had an infection in her uterus; the pup has not been found but a report of a mother seal and a small pup at Lincoln Park in West Seattle eariler may have been the dead female and her new pup, however there is no photo confirmation of the pair at Lincoln Park so only a verbal sighting report is available. The images below are of the female seal that died just north of Constellation Marine Reserve boundary.